This painting has a lot of surface that is white. My problem was how to make white interesting. Through experience I have learned to never use dull darks for shadows on white objects. Colorful darks add more interest and vibrancy to the subject. One just needs to exaggerate what is seen to create more exciting shadows. My colors were Gamblin’s Hansa Yellow Lite and Ultramarine Blue and sometimes Phthalo Blue for a little added punch to the greens. Gamblin’s Quinacridone Magenta, Dioxazine Purple and Radiant White for the pink flower petals. Center of the flowers were Brown Pink (a new color for me). The dark part of the center Dioxazine Purple was added. The highlight of the center was a mixture of Hansa Yellow Deep and Quinacridone Red. 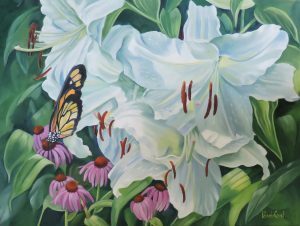 The white flower (lily) was painted with Radiant White. The shadows of the flowers were a mixture of Hansa Yellow and Ultramarine Blue lightly blended into the wet flowers. After the paint dried I glaze the center of the white flowers with Hansa Yellow Lite. My medium for quick drying was Gamblin’s Neo Megilp. A strong dark background that creates contrast also makes the white more dramatic. I mostly use Gamblin Oil Paints and sometimes Winsor Newton’s oils with my most recent paintings. I follow Gamblin on Instagram. Their website is a wonderful place to go for all the information you need for an exciting painting experience. Also on the website there is a place where you can send questions to Gamblin. They do answer. I have started a new white rose painting. I’m seeing a large variety of colors within each shadow such a violets, browns, blues, yellows, and reds. This is going to be a big challenge. I will have to think of the shadows as warm and cool so the painting isn’t disjointed. My next outdoor show is in St. Joseph, Michigan. “Krasl Art Fair on the Bluff” dates are July 14th and 15th. BOOTH 192.